Can you keep a secret? Moe Prager can keep a secret for a long, long time. 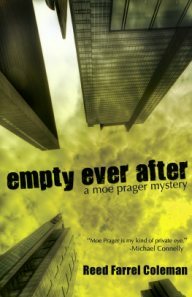 In “Empty Ever After” Moe’s secrets are not secrets any more. Patrick Maloney was Moe’s brother-in-law and has been dead and buried for a number of years. That is until recently. Patrick’s grave has been disturbed. Patrick’s remains have disappeared. This is only one of the many strange events that bring Moe’s past secrets to light. Moe is a retired NYPD officer and is now a PI. He is divorced from Katy but when Patrick’s grave is disturbed, he rushes to her side. Katy swears her dead brother's voice is on her answering machine and that he is appearing in various places but disappearing before she can get to him. Their daughter Sarah is very concerned about her mother’s welfare. Moe is determined to find out the purpose of the attacks on his family and to do everything within his power to protect his loved ones. Moe’s search for answers takes the reader down Moe’s memory lane. Moe must seek out someone from his past with a very twisted mind to take revenge this long after Patrick’s death and in this form. Empty Ever After is the fifth novel in the Moe Prager series. It is not necessary to read the previous novels in the series to totally enjoy number five. This is the best one yet in my opinion.